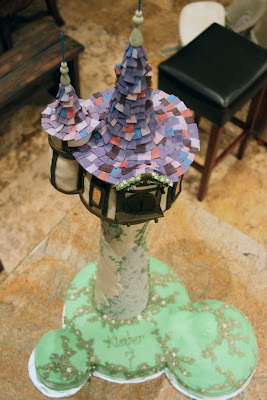 For my daughters 7th birthday she wanted a Rapunzel Party, so the fun challenge for me was making the cake! I think it turned out pretty cute, even though I know it's sort-of bragging to say so. I'm almost as proud that I finally posted on my blog as I am of the cake! This one's for you sis! love love LOVE it! I need more pictures, more close up's! How did you make the tower? How much is cake and how much isn't? Very awesome!! I make unique cakes like that for my kids' birthdays as well. I'm with Ashlee. Please do tell on the process of making this cake. Was every part edible or did you use other materials, etc.? HOLLIE!!! I think this is the best cake you have ever done!!! I need some more close ups! It looks SOOOO good. Im glad that Im not attempting that one, I don't want to compare to your's! So awesome! That had to take some serious planning and preparation. Something that I cant really do right now! Seriously AMAZING!!! My daughter is having a Tangled birthday party this weekend..I've been searching for cake ideas and this is the best cake I've seen!! Too complicated for me, but wow!! Good job!! Wow!!! This is the best Rapunzel Tower that I have seen. Amazing! Can you make me one!!!! "I LOVE IT"
Just came across your blog searching for some Tangled ideas. This cake...WOW. My jaw in on the floor. You are one talented lady and one incredible mother.